Are You Taking an Architectural Approach to IT Automation? What's the Difference Between an Architectural and an Elemental Approach to IT Automation? This means that most organizations are still taking an elemental approach to IT Automation. This approach results in higher costs of IT Operations, lower IT agility, and more overall complexity. 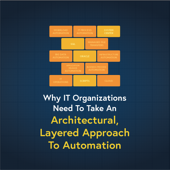 It is imperative that IT teams take an Architectural, Layered Approach to IT Automation. Learn more about Why IT Organizations Need to Take an Architectural, Layered Approach to Automation in this white paper!